A modern entertainment center might provide plenty of function, but what about the fun? The iPod Tabletop Jukebox and CD Player fills the need for something that both looks good and boasts plenty of functionality. 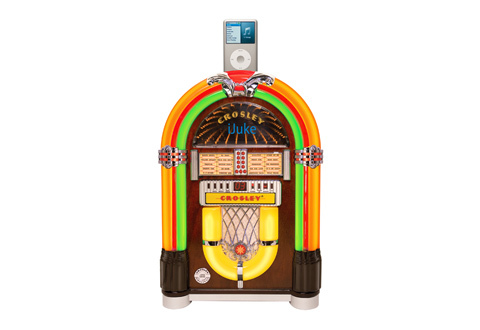 A nice addition to any Man Cave or game room, this clever device recalls the simpler times of rockin' around the jukebox, but in a no-fuss 18” tabletop design. The built-in iPod dock is compatible with iPods that feature a 30-pin connector. Plus, a built-in CD deck plays your favorite compact disc. Features eye-catching colored lights, stylish wood finish and full-function remote control. Plugs into an AC outlet. 9” L x 12” W x 18” H. 14 lbs. 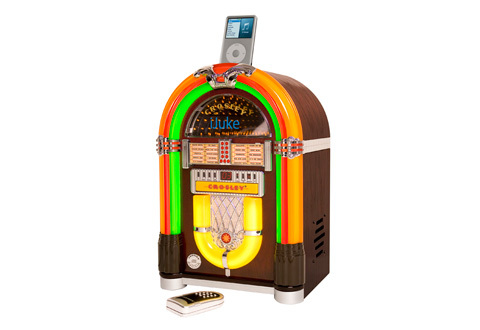 The iPod Tabletop Jukebox fills your room with crisp, dynamic music… and colorful dash of nostalgic fun!